1. Overdo the guest room portion and underdo the office. I know this may be hard if your guest room office combo is mainly an office 99% of the year, but this can easily be accomplished, or 'faked'. Storage and hidden storage are your friends. Hide gadgets and pens and paper in cute little baskets or boxes. Hide files in cabinets or drawers. If you have more office stuff than you think you can hide, incorporate it into your design or hide it on shelves behind curtains or doors. Incorporate the design of the office easily into the design of the guest room, then it won't feel like you are giving away your office to the guest room. 2. Have a place for guests to put their belongings, perhaps hang or fold their clothes. This can easily be fulfilled by making sure you keep a portion of the closet for guests. But, if you are like me and need all the storage you have for the office, simply remove items from a nightstand or dresser or shelf when guests arrive and offer those locations to them for their clothes and belongings. 3. Multifunction is your friend in tight spaces, especially when you are trying to get two main functions out of one room. An armoir can easily act as a desk for you when opened, with all your computer and cords and files hidden inside when shut and the the drawers below can be used for a guests use. Or you can use a larger nightstand/table for your office desk when guests are vacant, but when they arrive simply remove your computer and your desk becomes a cute nightstand. 4.Try not to overcrowd. Try to go minimal with your design and accessorizing. You don't want to pack too much into one space that it suffocates you or your guests. 6. 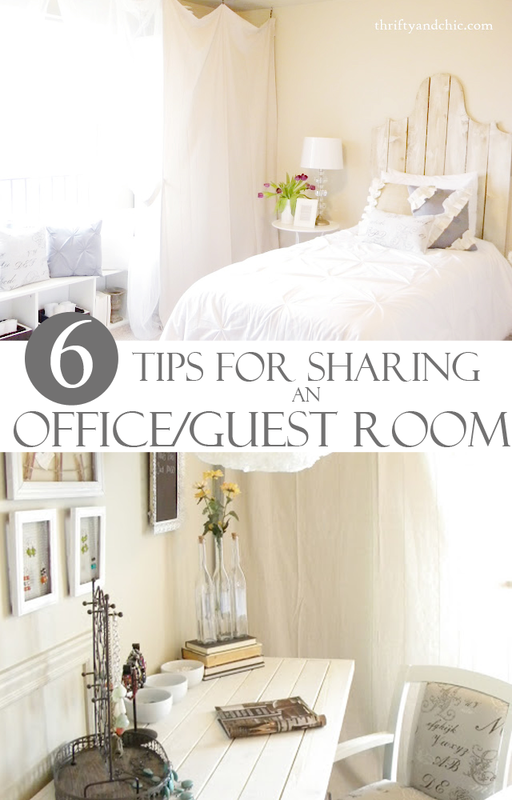 Incorporate the guest room design into the office and vice versa. Make the room look like it goes together, matching furniture styles and finishings. You don't want to look in the room and be able to delineate where the office starts and the guest room starts. If it is all designed together, the flow will be less noticeable and more comfortable for your guests.